David Friebus has 15 years of experience litigating complex matters in trial and appellate courts around the country. 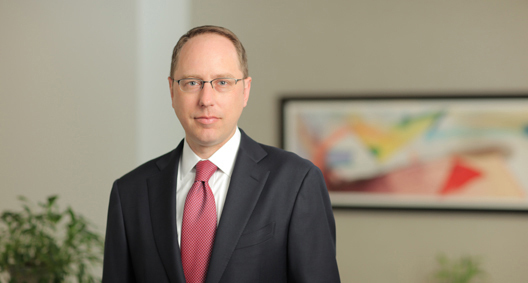 David has extensive experience serving as lead counsel in cases involving breach of contract, business torts, trade secrets and constitutional claims. He also has significant experience representing businesses in international arbitrations and other cross-border disputes. In addition to his trial work, David is an experienced appellate advocate. He has authored numerous briefs and argued several cases before federal and state courts of appeal. Clients also value David's sophisticated legal analysis and strong writing skills in shaping litigation strategy and briefing critical motions. Following law school, David served as a staff law clerk for the U.S. Court of Appeals for the Seventh Circuit. Represented a German engine manufacturer in ICC arbitration against a Latin American energy developer for breach of a €60M contract to construct an electric power plant in Brazil. Case settled favorably following enforcement of arbitration award in Brazil. Represented a manufacturing client in a lawsuit brought by a former vendor involving alleged misappropriation of trade secrets. Obtained summary judgment in favor of client. Represented a manufacturing client in post-trial proceedings in a $74M lawsuit involving misappropriation of trade secrets. Obtained permanent injunction on behalf of leading gaming technology company barring state agency from disclosing client’s trade secrets and other confidential information in response to public records request. Served as trial and appellate counsel for general counsel of a New York-based global shipping company accused by the company's former law firm of fraud in connection with $1 billion credit agreements. Case dismissed with prejudice. Represented a commercial airline in breach of contract action brought by an inflight internet service provider. Authored a brief successfully opposing interlocutory review by the Illinois Appellate Court of certified question regarding novel application of the Airline Deregulation Act. Represented Illinois's largest healthcare provider in federal and state court class actions arising out of a data breach involving four million potentially affected patients. Authored a brief successfully opposing review by the Illinois Supreme Court of dismissal of lawsuits. Represented a manufacturing client in lawsuit brought by a former parts supplier alleging breach of a requirements contract. Case settled favorably as a result of discovery strategy that revealed evidence of supplier’s fraudulent conduct. Represented a manufacturing client in breach of contract action brought by a former steel supplier. Case settled favorably following briefing on summary judgment. Represented a manufacturing client in disputes venued in Brazil arising out of a global joint venture to distribute commercial trucks. Represented an international medical school in a contract dispute with a New York-based healthcare organization. Case settled favorably following partial summary judgment in client's favor on liability and damages. Defended the State of Illinois in landmark litigation challenging political patronage in state and municipal government hiring practices. Authored a brief successfully opposing appointment of a federal monitor. Lead counsel in the trial court for the State of Illinois in Harris v. Quinn, 573 U.S. __ (2014), a constitutional challenge to fair share fees for public unions. Case dismissed; affirmed by the U.S. Court of Appeals for the Seventh Circuit; reversed by the Supreme Court. Represented an indigent litigant in two lawsuits involving the denial of medical care in violation of the Eighth Amendment. Represented an indigent litigant on appeal of adverse summary judgment ruling on a claim of excessive force in connection with arrest. Judgment reversed and case remanded for trial. Miller v. Gonzalez, 761 F.3d 822 (7th Cir. 2014). Represented an indigent litigant on interlocutory appeal of issue of first impression regarding the right to a jury trial under the Prison Litigation Reform Act. Pavey v. Conley, 544 F.3d 739 (7th Cir. 2008). Represented an indigent criminal litigant on appeal of sentence for credit card fraud. United States v. Mei, 315 F.3d 788 (7th Cir. 2003).